"Through play, children gain vital social, emotional, and physical skills, contributing to their overall healthy development. Play enhances children's well-being through spontaneous feelings of joy and happiness. Right to Play, in a partnership with the United Nations, proclaims that play is a universal and inalienable right of childhood through which children develop both physically and psycho-socially, while communities grow stronger." The mission of International Childhood Enrichment Program (ICEP) is to provide safe playground environments for children living at the edge of the world. They live everyday in countries poised at the abyss with few resources other than those for basic food, clothing, and shelter. 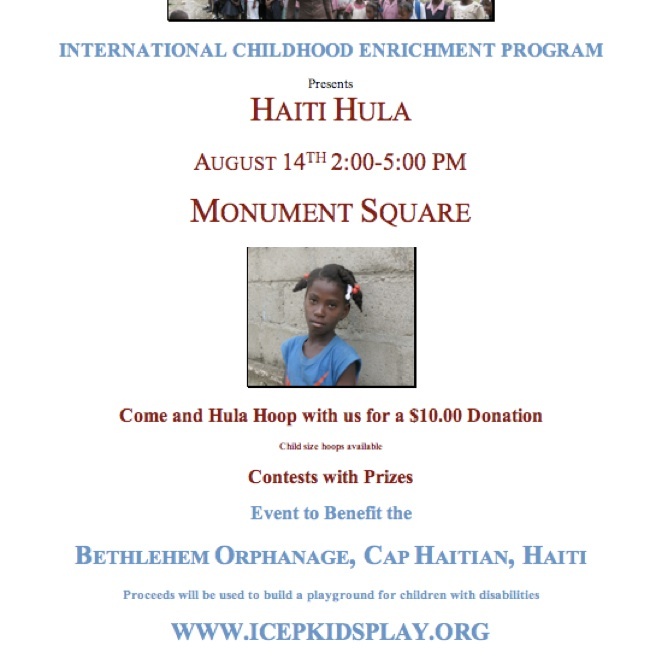 You can learn more about the area and the children's needs in Haiti or Afghanistan, where ICEP is currently represented. Please join us in building a playground in the country of your choice. If you'd like to make a small contribution or build an entire playground, you may do so on this site by clicking HERE. Your name can be associated as a donor with a particular playground or you can choose to remain anonymous. In any case, we are grateful for your interest and will hope you will continue to follow the progress on our site. If you become a donor, you will truly be making a difference in a vulnerable part of the world for the children living there. Following a series of trips to Haiti and the development of local contacts there, it was our intention to build our first playground in the small village of Prend du Monde. However, after severe floods, mud slides and armed rebellion in the region that plan was derailed, forcing us to stay closer to the capitol city. 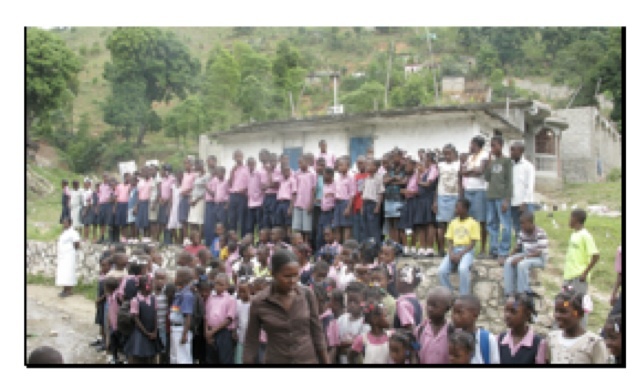 Below are pictures taken at the school in Port au Prince where the first playground was installed. 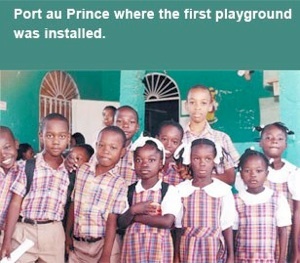 The ICEP focus for 2007 is to build four playgrounds in Haiti. The first playground in Haiti is under construction at the Ft. St. Michel Clinic in Cap Haitian. Dalinda Carpenter will be traveling to Cap in October to visit the site and photograph it. St. Michel is a neighborhood Health Center, brought to ICEP attention by Konbit Sante. Madame Jasmin, a nurse and director of the clinic, welcomed the suggestion of the playground and is excited for the children in this neighbor to have a place to play off the crowded street. 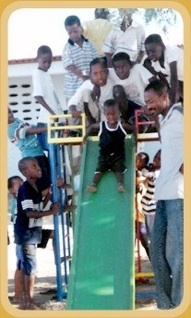 Two of our Haitian playgrounds will be build at schools. The Baptist Church of Good Faith, in City Chavel, which is another neighborhood of Cap Haitien, will receive a playground. The other school is a village community school outside the city of Milot. The school near Milot is being built by Lucia Anglade and her family, on the site of their childhood home. Lucia Anglade is now living in New York and is happy to help with education in her Haitien village. Lucia and her brother, Charles, travel back to Milot to supervise the school as often as possible. We were fortunate to meet her in Cap Haitien and visit the school with them. ICEP enjoys partnering with Lucia and her family and providing this school with a playground as soon as possible. ICEP is happy to have our representative Edy Joseph refurbish his childhood playground in his neighborhood as our fourth playground. Edy Joseph joined ICEP as our representative in the fall of 2006. We are very fortunate to have Edy working for us. We have enjoyed working with Edy on our trips to Cap Haitien and we look forward to seeing the playgrounds he is building. Javed will soon be starting the playground at the girl's school in Qarabagh, Afghanistan. He was responsible for the wonderful playground footage in our ICEP video. The ICEP Board of Directors in 2006, nominated and elected Dalinda Carpenter as Executive Director. ICEP began to focus on evaluating our progress of the past years and on ways to attain our goals for the future. ICEP Vice President Kerem Durdag took on the challenge of producing an ICEP short video presenting our program. This video is available by request and we hope that it will encourage corporate support for our organization. Video was taken by our representatives in Afghanistan and Haiti showing the children enjoying the playgrounds, provided by ICEP. Watching them at play and the sounds of their happy voices is a real joy. We hope that their joy is contagious and you will help us spread it. Dalinda Carpenter traveled to Haiti for the first time since 1996 in 2006. For her, it marvelous feeling to return, knowing ICEP had something to offer the people of Haiti. She visited schools and clinics and walked though neighborhoods. The people of Haiti were just as friendly and welcoming to her as she remembered from 1996. She also met Edy Joseph, who was hired become our ICEP representative in Haiti. There are many places in Haiti with children looking for a safe place to play, ICEP looks forward to providing them with those places. Just as the children in Port Au Prince have caught the "joy" with our playgrounds, now it is time to spread that "joy" to Cap Haitien.